In first pAsuram, AzhwAr says “What abundance of sins committed by me which make you not accept me even after calling out for a long time?”. mUrththI – Oh emperumAn who is an embodiment [of such knowledge]! nArAyaNA – Oh one who is having the inseparable relationship to know the means for protection! peridhAl -they are very great. Oh emperumAn who is an embodiment of distinguished knowledge by consuming and protecting all entities! Oh one who is having the inseparable relationship to know the means for protection! repeatedly speaking about your characteristics, at all times without any break, I am calling out loudly with my hand on my head; [but] you are not coming to show your physical form which is very attractive to see; you did not call me to your place either; even though I am ignorant and lowly without any good background, sins accrued by my actions are very great. seelam illA – seelam means goodness. That is vruththam (good conduct). Good conduct is indicated by the word seelam. It is not that I have anything good in me now, but I have no basis for having any future goodness in me. siRiyanElum – AthmA is miniscule in nature and its gyAnam is all-pervading [in the bodies where the AthmA can reach out]; due to the sorrow, having the all-pervasive nature subdued, AthmA [AzhwAr] merely existed [as a miniscule entity]. Even though I am very small without any goodness now and not having any basis to acquire goodness in the future. sey vinaiyO peridhAl – [But] looking at the accrued sins, it appears that it has grown over and above the three entities namely chith (sentient entities), achith (insentient entities) and ISvara (bhagavAn) and consumes all 3 of them. It appears to have become bigger than ISvara’s qualities which tolerate samsAris (materialistic people) and the knowledge in the form of devotion which was bestowed by emperumAn; [this is because] even that knowledge is useless and even while his qualities are manifested, my sins are accumulating. In this world thathva thrayam (the collection of three entities) is huge; greater than that is AzhwAr‘s gyAnam; the greatness of his sins is bigger than such gyAnam. sey vinai – These were physically committed by one unlike emperumAn’s sankalapam [which occurs just by his thinking about those]. O – How amazing! Also explained as AzhwAr‘s great sorrow being revealed in this [as “alas!”]. When asked “If he can be awakened just by the discussion on divine names, what sins does he have?” – It is that [time immemorial] sin which causes him to miss out on the experience to his heart’s content such bhagavAn who makes him sustain himself. sIthA pirAtti too said in SrI rAmAyaNam sundhara kANdam 38.48 “mamaiva dhushkrutham kinchith mahadhasthi …” (My little bit abundant sins are the cause for my current situation even while SrI rAma and lakshmaNa who could protect me were present). 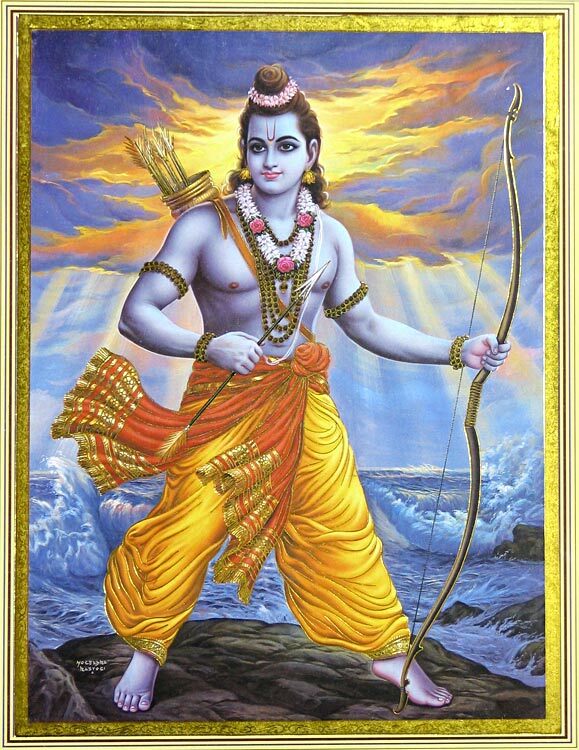 They (SrI rAma and lakshmaNa) are capable of completely uprooting all the enemies and protecting me; they grew up strong and made their enemies bite the dust previously; and I am suffering so much that they should have protected me even at the cost of themselves; this being the case, they did not mercifully glance at me [and protect me]; the reason for this is due to some fault [sins] either in them or in me; I cannot find any fault in them; so this must be my own sins. “kinchith” – as we are not sarvagya (omniscient) to know everything, there should be some sin in us which we are not aware off; this must be deduced by the result [suffering we are going through now]. gyAlam uNdAy – When contemplating on the abundance of sins, those who depend on self efforts will start thinking about atonement for the same; but AzhwAr is firmly of the belief that “emperumAn has got the remedy for this in his hands”; AzhwAr himself said in periya thiruvanthAdhi 87 “eppOdhum kai kazhalA nEmiyAn nam mEl vinai kadivAn” (emperumAn who always has sudharSana chakra attached to his hand, will drive away our sins); this is “sudharSana” [the chakra which brings auspiciousness by its sight] as said in jithanthE sthOtram “bhagavathO balEna” [with bhagavAn‘s strength]; hence AzhwAr is contemplating emperumAn’s nature. SrI rAmAyaNam ayOdhyA kANdam 62.20 “gajamvAvIkshya” [sIthA pirAtti did not fear seeing elephants, tigers and lions, since she was under the protection of SrI rAma] and so on. gyAlam uNdAy – Is emperumAn not of the nature that he will come and help when there is great danger which has no other protection? Would he protect only if the whole word is under a deluge? Would he not help if all the dangers that envelop all the persons, fall on one person? Would be only help those who do not realise their danger and who do not call out? Is there any compulsion for him not to help those who realise their danger and call out to him? It is only on that day when the word, under deluge, makes an attempt to lift itself can one have the means to remedy one’s own sins. For you to protect, you only need a relationship and a person in danger. gyAna mUrththI – I have knowledge to make myself a nithya samsAri (eternally bound in this world). Don’t you have the knowledge to eliminate such thoughts from me and engage me in good path? As said in thiruvAimozhi 4.9.2 “AmARu onRu aRiyEn nAn” (I don’t know the path which is beneficial), periyAzhwAr thirumozhi 2.7.8 “AmARu aRiyum pirAnE” (Oh benefactor who knows the proper path), jithanthE sthOthram “naiva kinchith parOkshanthE” (there is nothing that is not known to your highness) – there is nothing that I know and there is nothing that you don’t know; if there is nothing that I can do, and nothing that you cannot do, then for whom is a task difficult to achieve? When a person [AzhwAr] is both blind and lame and another person [emperumAn] has good vision and walking ability, who will lead whom in the proper path? Oh one who is having the knowledge of one’s disease and its remedy as true nature! nArAyaNA – Oh emperumAn who is aptly related to me to protect me! By saying “nArAyaNa“, it implies that AthmA is subservient to bhagavAn like body to soul. But would SarIra (body) or SarIrI (soul) try to attain the benefit? only the owner will try to acquire his belongings [bhagavAn is the owner of everything which is also indicated by the word “nArAyaNa”]. enRu enRu – The reason for repetition of “enRu” – since nArAyaNa word is focussed on qualities such as vAthsalyam (motherly affection) etc which make him the upAyam (means) and qualities such as SEshithva (lordship) etc which make him the upEyam (goal). Now, AzhwAr is not of the nature that he would say something to get something and after acquiring it stopping to say so; as the present tense in upAyam [here, it is talking about prapadhyE (surrendering) in dhvaya mahA manthram], this continuous calling out in itself is the goal for him. This is explained in mudhal thiruvanthAdhi 95 “namO nArAyaNA enRu OvAdhuraikkum urai” (the words of “namO nArAyaNA” which is constantly recited). kAlam thORum – Am I reciting this now and subsequently saying “there is some other worshippable aspect” and engaging in that? [No – always engaged in emperumAn]. yAn irundhu – Even after suffering do I have to live long for 100 years? When separated from emperumAn who is abundant with auspicious qualities, the desire will not let one die and make one think “Can we see him one more time?”. kai thalai pUsal ittAl – Three explanations – 1) When I keep my hands [in anjali mudhrA – joined palms] on my head, should you not manifest yourself? 2) When I keep my hand on my head [with sorrow] and call you out loudly; 3) When I have my hands on my head forever and call you out. kOla mEni – If that divine form is not presented for those who are desirous to see, what for is that form? Isn’t it said as in jithanthE sthOthram “bhakthAnAm” [his forms, etc are for his devotees]? As cool water is kept out of reach for thirsty person; this water is not useful for those who are desirous; [is he water?] he is said as in thiruvAimozhi 10.1.8 “maradhaga maNith thadam” (emerald pond). kANa – Would those who are searching for karumugai mAlai (garland of dark coloured flowers), do so for wearing it or for keeping it as a base to carry some weight on it? Even after attaining, emperumAn is said as “sadhA paSyanthi” (nithyasUris are always seeing emperumAn); here also it is as said in siRiya thirumadal 69 “kArAr thirumEni kANum aLavu” (to see emperumAn’s cloud like divine form); he is said in nAnmugan thiruvanthAdhi 39 “azhaippan thiruvEnkataththAnaik kANa” (Calling thiruvEnkatamudaiyAn (SrInivAsa) to see him); as said in SrI rAmAyaNam sundhara kaNdam 25.16 “dhanyA paSyanthi mE nAtham” (Many pious great souls are seeing my husband); sIthA pirAtti said “The whole world is stealing my belonging”. vArAy – When seeing such divine form, it is apt to know that only by his grace, he is coming. kANa (to see) – prApyam (goal); vArAy (come) – prApakam (means). Alternative explanation – vArAy – not coming; if you are not coming, we cannot force you to do so. Even if you are not willing to fulfil my desire, it is required for me to have my sorrow eliminated. kUviyum koLLAyE – You are not accepting, even if I call you out, which is not proper [you should have come yourself instead of me calling]. Even if I pray continuously, you are not appearing with your divine form; even if I call out, you are not accepting and coming; reason for this is, even though I am miniscule without any good qualities, my sins are great;. [artha panchakam explanation] By saying “nArAyaNa“, prApyam (bhagavAn) is explained. “siRiyan” explains Athma svarUpam (nature of AthmA); “vArAy” explains upAyam (means); “kANa” explains palam (goal); “seyvinaiyO peridhu” explains virOdhi (obstacle); thus artha panchakam is explained. This entry was posted in thiruvAimozhi, thiruvAimozhi 4th centum on March 14, 2017 by Sarathy Thothathri.